Colombia Peace Agreement Means Western Hemisphere Has No Wars : Parallels Fidel Castro's 1956 leftist insurgency set the tone in Latin America for decades. He died on Friday, the day after Colombians signed a peace deal to end the last major uprising. 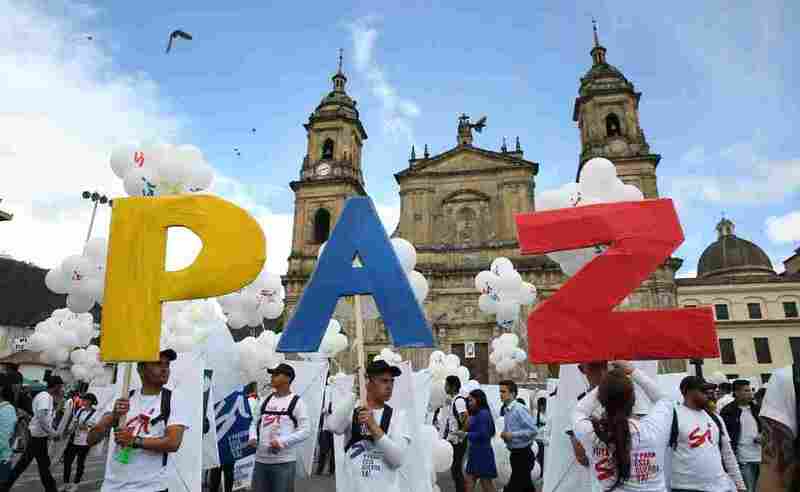 Colombians in the capital, Bogota, hold up the letters for "peace" in Spanish in September. That agreement between the Colombian government and FARC rebels was rejected by voters in an October referendum. An amended agreement was signed Thursday and is expected to be approved. If implemented, it would end 60 years of nonstop conflict in Latin America. Editor's Note: This story was originally published on Sept. 27, 2016, and is being republished with minor updates following the death of Cuba's Fidel Castro. 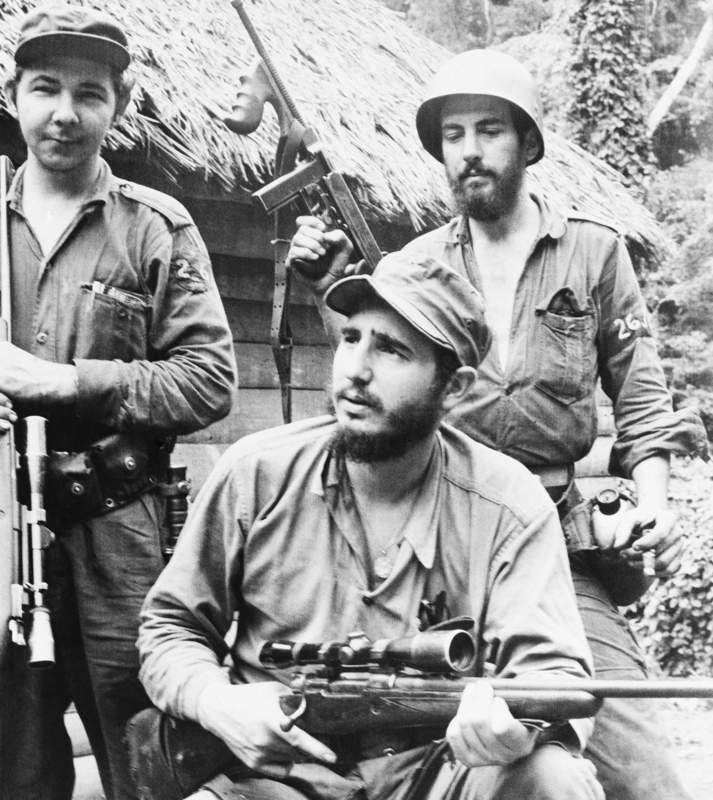 How's this for historical coincidence: Fidel Castro and his rag-tag fighters assembled in Mexico, navigated an overcrowded boat to Cuba, and unleashed a 1956 insurgency that spawned countless imitators in the decades that followed. On Thursday, Colombia and the FARC rebels signed a deal to end the last major leftist uprising in Latin America — one day before Castro died. Castro's Cuban revolution set the tone for Latin America, where authoritarian governments, often led by generals, battled leftist guerrillas in most every country at some point over the past half-century. Colombia's agreement this week was a do-over that illustrated how elusive peace has been in Latin America. President Juan Manuel Santos first signed an agreement with the rebels in late September, but Colombian voters narrowly rejected it in an Oct. 2 referendum. The deal was amended, and this time it will be voted on in Congress, where Santos' coalition holds a majority and is expected to approve it. "As president of all Colombians, I want to invite all, with an open mind and open heart, to give peace a chance," Santos, the winner of this year's Nobel Peace Prize, said at the signing ceremony with the rebel leadership in the capital Bogota. The goal is to bring peace to a country that has endured more than a half-century of civil war. Widely overlooked is the far more sweeping notion that it would bring down the curtain on six decades of nonstop conflict in Latin America. To take an even broader view, there's no longer a single war in the Americas, a collection of more than 30 countries stretching from the Canadian Arctic to Tierra del Fuego at the bottom of South America. Fidel Castro, shown here in 1957, led his rebel movement from the mountains of eastern Cuba. His 1959 revolution ignited leftist insurgencies throughout Latin America that lasted for six decades. Of course, the absence of war isn't necessarily full-fledged peace. Mexico still suffers chronic drug violence, as do several other countries. The Central American nations of Honduras, Guatemala and El Salvador are riven with gangs responsible for some of the highest murder rates in the world. Venezuela is wracked by political turbulence. And even as Colombia's main guerrilla group agreed to lay down arms, a separate, much smaller rebel faction carries out the occasional attack. "The region has made tremendous progress from 20, 40 years ago," said Richard Feinberg, a professor at the University of California, San Diego, who closely follows Latin America. "On almost every front — politics, economics, social programs — we've seen vast improvements." Castro Fires The First Shot: The Cuban revolution wasn't the first uprising in an unstable region, but it did mark the dawn of a new era that had major ramifications all across Latin America. 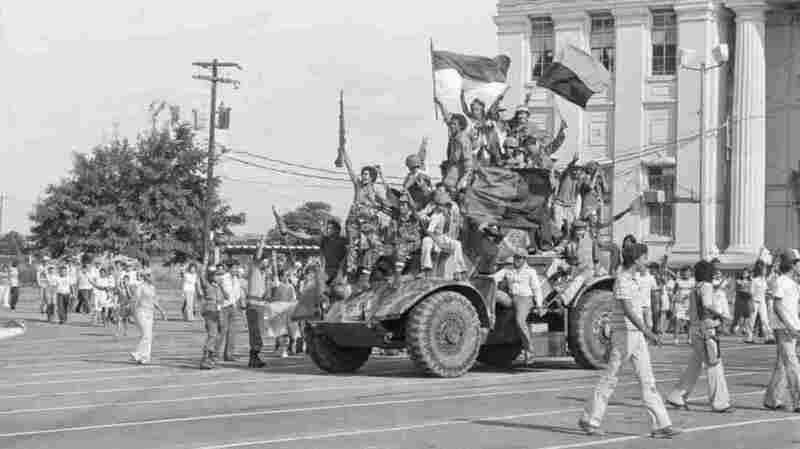 Sandinista rebels ride an armored vehicle through Managua, the Nicaraguan capital, on July 19, 1979, after ousting dictator Anastasio Somoza. Latin America has endured civil wars for the past six decades, but only two groups, the Sandinistas and Fidel Castro's rebels, ousted leaders by force. Castro inspired many who adopted his leftist politics and sought to oust authoritarian rulers, many of them strongmen who seized power through coups. They tended to represent the military and the tiny elites who dominated politics and business. Cold War politics drove the U.S. to support pro-American rulers, even outright dictators, while the Soviets looked for additional opportunities to expand their influence. In this bipolar world, there was little, if any middle ground. Genuine democracy and competitive elections simply weren't part of the equation. "The U.S., the Cubans, and sometimes the Soviets would be feeding these conflicts with ideology, money and weapons," said Feinberg, author of the recently published Open For Business: Building The New Cuban Economy. "All these international actors were polarizing, and you didn't see any change in their behavior until years later, when the Cold War was over." 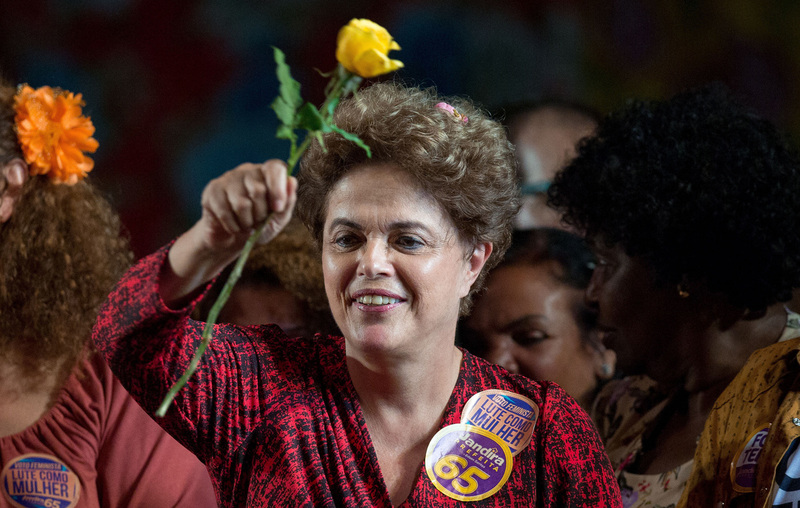 Brazil's former president, Dilma Rousseff, attends a political rally in Rio de Janeiro on Sept. 21. Rousseff, who was jailed for three years in the 1970s as a member of a guerrilla group, was twice elected president in Brazil. She was impeached last month. Colombia's civil war offers an extreme example. It erupted in 1964, has involved multiple rebel groups, and claimed more than 200,000 lives. The weakened country was also vulnerable to the emergence of drug cartels, which in the 1980s and '90s arguably posed a greater threat than the civil war. Yet in all these years of Latin American warfare, only two rebel groups ousted rulers by force: Castro's fighters toppled Fulgencio Batista in Cuba and the Sandinistas brought down Anastasio Somoza in Nicaragua in 1979. "Revolutions are extremely hard to pull off," said Feinberg. "Most attempted revolutions fail miserably at tremendous cost to everyone involved. Conditions are rarely there for violent overthrows. For starters, you need to be facing a very decrepit regime." The Cold War's End Eases Tensions: The end of the Cold War rapidly reduced regional tensions, led to peace treaties and elections, and helped create the space for Latin American countries to work out protracted feuds. In Uruguay, El Salvador and elsewhere, former rebels won elections. Brazil's Dilma Rousseff, who was jailed for three years and tortured as a member of a guerrilla group in the 1970s, was elected president twice, once in 2010 and again in 2014. She was, however, impeached in August on corruption charges, a move her supporters called a "coup." Politics in Latin America is still a rough business. But these days, it's no longer waged with guns. Greg Myre is the international editor of NPR.org. Follow him @gregmyre1.